by Stephanie Pride It says a lot about the state of local politics in Falkirk that one socialist can rudely heckle another during what is ostensibly a debate about independence. I’m not particularly proud to say that I was the heckler and the other socialist (by his own description) was Michael Connarty, MP for Falkirk East, and one of the few Labour rebels to vote against the benefits cap at Westminster. 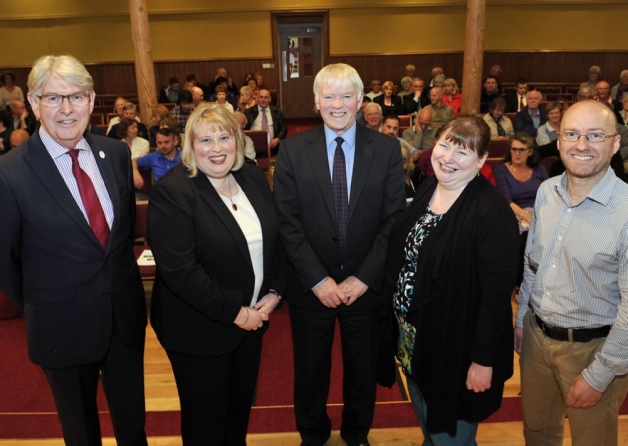 Connarty, who declared himself a socialist three times at a recent referendum hustings organised by the Falkirk Herald, was clearly desperate to parade his left-wing credentials to an audience that appeared evenly split between the Yes and the No camps, but was overwhelmingly anti-Tory. While I have nothing against Connarty, who I am sure is sincere in his desire for social justice, his view that the best way to achieve working class solidarity and a nuclear-free Britain is by staying part of the union and putting your faith in the Labour Party was deserving of derision. On the Yes side, the SNP’s Clare Adamson MSP was equally keen to prove her left-leaning credentials. In a bid to outflank the Labour opposition, she denounced a UK minimum wage that she maintained was a tenth of the national average! Needless to say, it wasn’t long before the two sides were slugging it out over some highly contestable facts and figures, with only Patrick Harvie MSP prepared to acknowledge that not every point made by the other side was illegitimate. Indeed, the presence of the Scottish Green Party leader really showed up the circus of the SNP-Labour rivalry with its hair-splitting hysteria and earned by far the greatest applause from an audience sick of the sideshow of SNP and Labour bickering. Of course there is nothing new here, and the picture in Falkirk mirrors the quality of the national debate over independence. For some years, Labour and the SNP have been locked in an increasingly bitter power struggle in Falkirk, with the nationalists gaining ground in recent times. However, it is Labour who rule the roost on the council, with a 14-13 split in their favour – despite the SNP winning a greater share of the first-choice vote. For the SNP, it must have hurt to lose power on the cut of a pack of cards when both sides were tied in 2007, while it rankled even more to see Labour go into coalition with the Tories to achieve an overall majority in 2012. Since then, the SNP group has boycotted meetings of the council in protest at the ‘undemocratic’ carve-up of executive power, despite doing exactly the same thing themselves on other councils. Leading activists have wasted no time in accusing Labour of suppressing criticism and dirty tricks – even shortening the height of a flagpole bearing the saltire ‘for political reasons’ (a claim which turned out to be groundless). Given their populist stance on community issues, such the local campaign against coalbed methane extraction in Airth, the SNP have effectively cast themselves as the champions of grass-roots democracy against an out-of-touch Labour Party machine hell-bent on power at all costs: simultaneously ‘in hock’ to the unions, ‘contemptuous’ of its membership and ‘in bed with’ the Tories (when its most prominent former member is not drunkenly aiming punches at them!). That they have been able to do so is testament to their hard work on the ground, not least in the Yes campaign, while the local Labour Party has lurched from one debacle to another and could even lose their once safe Westminster seat (currently occupied by the ostracised Eric Joyce) at the next general election. For all their posturing, however, there is little to choose between the two main social democratic parties in Scotland other than their stance on independence, and as Patrick Harvie pointed out at the local hustings, a lot of their manufactured differences come down to who is in power. For example, in the Scottish Parliament it was Labour who argued for imposing a condition on public contractors of offering the living wage, while the SNP opposed it on the grounds that it could fall foul of EU competition laws. Harvie said the positions could well have been reversed had Labour been in power, although the Nationalists in particular have a record of blaming other institutions for their own shortcomings, which would somehow all be overcome if they presided over an independent Scotland. In truth, neither party can deliver on its rhetoric and it is up to the likes of the Scottish Socialist Party to expose this and offer a real alternative to the rejection of politics which is so often the public response, not least in Falkirk.